Operation Robot Storm by Alex Milway. A Mythical 9th Division Novel. Review: Albrecht, Saar, and Timeon embark on a stormy adventure in Operation Robot Storm by Alex Milway. The fury British giants take on many mythical monsters and bad people. These yetis go on many adventuress in The Mythical 9th Division so make sure you read all of them. Three yetis travel to Wales to investigate some missing soldiers lost in snow. They were lost in Wales but in this time of the year it doesn't snow there. On their mission they will have to find the soldiers but is there something else behind this storm. Does the crazy snowy weather have anything to do with it and did anyone mean to make the weird weather. What parts do the robots play in the story? Is there something that nobody knows, you'll just have to find out yourself when you read Operation Robot Storm. If you are in the age group of from 4th grade to 7th grade this is the right book for you. If you like a challenge this book has some high level vocabulary but if it's to hard you might not like it. Also its plot has some twists and turns that might be confusing for some people but if you read on it will make sense. The Mythical 9th Division series has all the adventures of Albrecht, Timeon, and Saar. 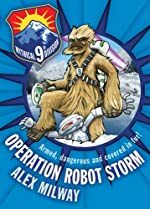 Operation Robot Storm is the first book in the hairy series. So don't miss out on Operation Robot Storm. We would like to thank Kane Miller for providing a copy of Operation Robot Storm for this review. Have you read Operation Robot Storm? How would you rate it?